Between the 2 and 4 May, Professor Salman Rawaf, Ms Federica Amati and Dr Sondus Hassounah participated in WHO Regional Office for Europe’s (WHO EURO) ‘Consultation of the European Framework for Action on Integrated Health Services Delivery’ — a high level international meeting and workshop aiming to strengthen people-centred health systems, as set out in Health 2020, that strives to accelerate maximum health gains for the population, reduce health inequalities, guarantee financial protection and ensure an efficient use of societal resources, including through intersectoral actions consistent with whole-of-society and whole-of-government approaches. During the consultation the framework’s vision, strategic approach and priority areas of action in alignment with other Regional policies was discuseed. During the initial two day seminars by member states and experts the framework which sets out a number of areas for strengthening people-centred health systems by undertaking transformations for integrated health services delivery was discussed. On the 3rd day a workshop took place where a handful of countries and partners were invited to partake in the exercise of putting the framework to action. 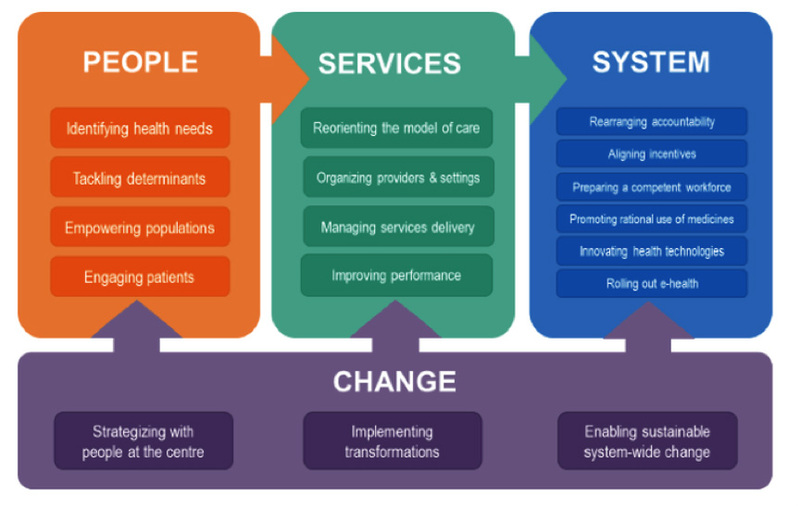 Change – a cross-cutting property that facilitates the process of managing health services delivery transformations. Source: WHO Regional Office for Europe. At the request of the WHO Regional Office for the Eastern Mediterranean (EMRO), Imperial College London and it’s WHO Collaborating Centre for Public Health Education and Training (ICL-WHO CC) organized a three days bespoke intensive training tailored to develop and build the capacity of a cohort of mid-level and senior health professionals in leadership in epidemic and pandemic preparedness and response. The training on Leadership in Epidemic and Pandemic Preparedness and Response under PIP (Pandemic Influenza Preparedness) Framework was an intensive training intended to equip health professionals with the tools required to manage their selves, organisations, services they provide and health systems they work in, efficiently and effectively, with particular emphasis on epidemic and pandemic situations. The content of the training is built around the best practices observed in recent epidemic and pandemic situations as well as WHO guidance for Pandemic Influenza Preparedness and Response and aims to help participants become more effective, efficient and successful leaders in a knowledge-based health system. This training was designed to meet the needs of mid-level and senior health managers and professionals involved in epidemic and pandemic preparedness such as director of surveillance/ disease outbreak preparedness at Ministry of Health level and WHO Country Offices in the Eastern Mediterranean Region. Participants included managers/leaders in their fields e.g. directors of surveillance or preparedness, as well as senior surveillance, disease outbreak and preparedness officials at the at Ministry of health of the seven priority PIP countries in the Region which include: Afghanistan, Djibouti, Egypt, Jordan, Lebanon Morocco, Yemen—in addition to Iraq, Kingdom of Saudi Arabia, Pakistan, Sudan and Syria. Dr Barry Walsh (Independent Consultant in Communicable Disease Control); Dr Gaya Gamhewage (Head of Knowledge Transfer and Training – Pandemic and epidemic Diseases Department in the Outbreaks and Health emergencies Cluster, WHO HQ); Dr Caroline Sarah Brown (Programme Manager Influenza and other Respiratory Pathogens Programme, WHO EURO); Ms Heini Utunen, (Pandemic and epidemic Diseases Department in the Outbreaks and Health emergencies Cluster, WHO HQ); Dr Bayad Abdalrahman (Consultant in Communicable Disease Control, Public Health England); Dr. Hatem Alaa Marzouk (Mental Health Advisor, Psycho-Social Services and Training Institute); and Dr Sondus Hassounah (Teaching Fellow, WHO Collaborating Centre for Public Health Training and Education – Department of Primary Care & Public Health, Imperial College). The WHO CC will be presenting two posters at the Wellcome Centre for Global Health Research Annual Meeting in June. The first poster will be of a review the team and collaborators have been working on to quantify and describe the current state of mental health in Iraq, encompassing disease prevalence, cultural context, service delivery and human resources and facilities for health. Christina Banks, Research Assistant at WHO Collaborating Centre for Public Health Education and Training will also present a poster at the meeting detailing her Masters Dissertation project on factors influencing the process of using policy for tobacco control. This was conducted through literature review, conducting interviews and comparison of data, and was carried out under the supervision of Professor Rawaf and Dr Hassounah.